I’ve always been intrigued by this dish known as shakshouka. 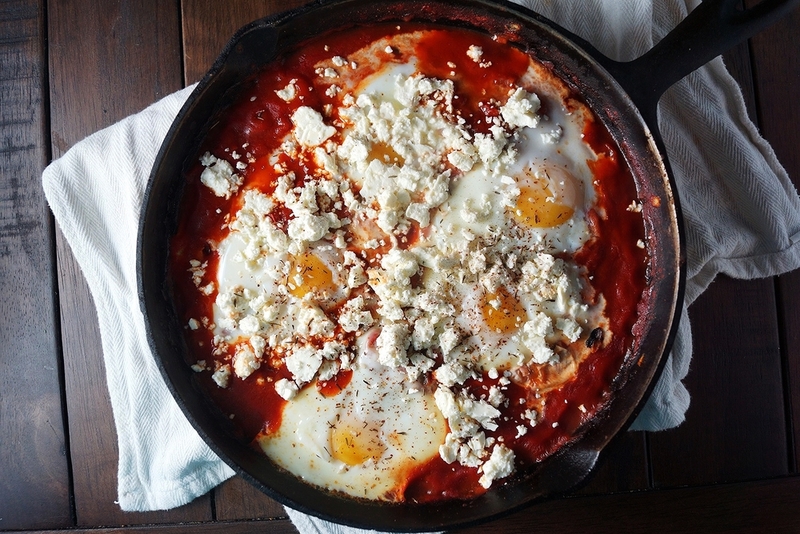 It’s a middle eastern dish of eggs cooked in a spicy tomato sauce. And besides sounding delicious, is really fun to pronounce. I’ve seen versions of it pop up in various food magazines and food blogs, and every time I can’t help but think how amazingly good it looks. Let’s be clear, I am always down for any sort of dish that involves soft cooked eggs, and well, when you throw in a nice spicy tomato sauce and some cheese, it only sweetens the deal. I always meant to make it, but for some reason or other, never seemed to get around to it. Finally, I decided it was time to give shakshouka a try. Or at least my version of shakshouka. I threw some peppers, onion, and garlic in a pan, added some jalapenos for heat and some cumin and paprika for a nice smoky flavor. I threw in some tomatoes, cracked in some eggs, and before long, I was digging into a big warm bowl of the stuff. Obviously, I topped it with some briny feta and a sprinkle of z’atar, because, as we all know, adding cheese makes everything better. And of course, having some warm pita bread on hand to soak up the extra sauce was a necessity. It was delicious, and yet, I felt there was something missing. It needed something bright and green to round it all out. In about two minutes, I had whipped up a super quick salad of cucumber and fresh herbs. A squeeze of lemon, a dash of olive oil, and a pinch more z’atar (I can’t get enough of the stuff), and we were there. It was perfect. All that was left to do was devour it. Z’atar is a middle eastern spice blend of sumac, thyme, sesame seeds, and salt. I picked some up at Penzeys on a whim a few years ago, and since then have not been able to get enough of it. Besides sprinkling it on shakshouka, it’s amazing on roasted chicken, in salads, and on pita chips. I’m sure you can think of plenty of other delicious uses for it as well. You can buy it from Penzeys of course, or mix up your own (2 Tbsp sumac, 1 Tbsp thyme, 1 ½ tsp white sesame seeds, ½ tsp salt). 2. Start by making the shakshouka. Heat the olive oil in a cast iron pan over medium heat, and once hot, add the onion, bell pepper, jalapeno pepper, garlic, cumin, paprika, and salt. Cook, stirring often, until vegetables are soft, about 5-6 minutes. 3. Add the crushed tomatoes and tomato paste, stirring to combine. Bring to a boil, then reduce heat to low and cook, stirring occasionally, for about 10 minutes. 4. While sauce is simmering, make the salad. Mix all salad ingredients in a bowl and let stand for flavors to develop while you finish the shakshouka. 5. After sauce has cooked for about 10 minutes, make 6 indentations in the sauce and crack one egg into each. Place pan in oven and cook at 400 until whites are set, but yolks are still runny, about 8-10 minutes. 6. Remove pan from oven, and sprinkle evenly with feta and z’atar. Serve hot along with the salad and warm pita to soak up the sauce.